Conventional paving relies strictly on the pavers use of hot asphalt mix from the local asphalt plant which may cost; perhaps 30%, 40%, 50% or more per ton depending on location and time of the year. In addition, there are associated costs in obtaining and delivering hot mix patching material to the job site. Contrary to this typical practice of securing hot mix from the local plant, recycling your own pavement ON SITE with the RENOVA saves these costs; perhaps 30% to 40% or more. PotHoles notoriously require repeated repair for multiple reasons. Oftentimes, this is due to the fact that once the hot asphalt mix leaves the asphalt plant it begins to cool down before it is applied. For maximum compaction and durability, the material used in the repair should be at optimum temperature. Better compaction increases density and prevents the penetration of moisture, thereby ensuring the integrity of the sub-base. Otherwise, the repair is inadequate and there is the likelihood of an inferior patch which may require an expensive, repeated repair. The RENOVA Process eliminates this possibility first by producing hot mix ON SITE at the spot of the repair where the temperature is maintained at its optimum level. Secondly, additives are used in the RENOVA to produce a high-quality mix which ensures the durability of the repair. A premium quality hot asphalt paving mix, better than new, from existing old pavement is produced by adding an “eco-friendly” additive including asphalt cement and crumb rubber. The resulting mix is rejuvenated and provides exceptional benefits including adhesion, elasticity, and resilience to the repair; allowing movement and qualities which are crack and rust resistant. 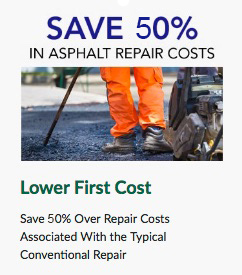 Avoid repetitious post-repair long-term costs with a machine that offers the assurance that repairs that will outlast the surrounding pavement within which the repair is made. 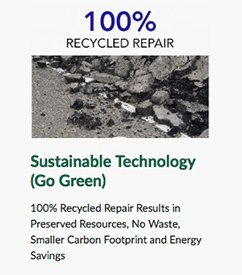 A truly “green” process and product, have your asphalt pavement recycled onsite with the RENOVA and save money; and help save our environment by re-using materials that you already own and that are 100% recyclable. 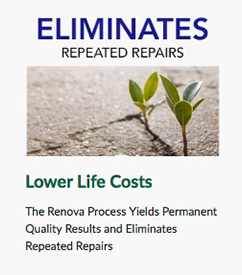 The RENOVA asphalt recycler allows communities to start recycling their old asphalt instead of wasting this resource; saving community dollars that otherwise are spent needlessly buying conventional asphalt from the asphalt plant time after time. Why Should You Own A Renova? To elevate how pavement repairs are performed to their highest sustainable level possible.